These are the perfect shoes for just about any activity, and the low price is a bonus. They are comfortable and come in regular and wide sizes for men. Messy yard work? Wipe them off with a wet rag! Going on an all day adventure? No problem doing a lot of walking. When I first put them one the shoe felt pretty darn good but my heel was slightly uncomfortable after a day on my feet. After about 7 days my foot is fully settled into the shoe and they are very comfortable. I particularly appreciate the beefed up side support on these shoes. I bought a pair of these shoes in very early December, and immediately liked them. Inexpensive, but very comfortable, and simple basic black and maroon appearance, which is what I prefer. I've worn them virtually every day for 4 months now, and they are holding up quite well. I have decided I like them well enough that I ordered 2 more pairs so I will have them on hand when needed. I bought the same size as I have in the past but this shoe fits differently - it's smaller. Why a company would change the size of a particular shoe and continue to market it as the same shoe is beyond me. though company offer a free replacement, it has wasted subsequent amount of time. So sorry for the inconvenience to you, this model runs small, so we recommend a upper size will be better, any problem please feel free to contact us, our customer service will help you resolve the problem soon. After reading all the good reviews I bought this shoe. Never had this shoe before. This is my last. There is no cushioning what so ever. It's like your walking on cement with bare feet, only there is this uncomfortable thing wrapped around your foot called a Chamaripa shoe! I bought this in place of expensive Orthopaedic shoes. There is plenty of room and they are very comfortable. Fit great, I have several other pairs from the same manufacture and they all are a solid value. It goes well with all kinds for dress. Well worth your hard earned money! I've worn these shoes periodically over the last 5 days for a total of about 20 hours. Not only do I have some neuropathy, I currently have plantar fasciitis. Tonight I was on my feet continually for about 2 hours. My feet don't hurt! I think these shoes have a bit larger toe box which I like. The insoles are removable so I could put in my own orthotics. Great shoe and the most comfortable I own. And I have lots of shoes... Oh, the size I ordered fit me perfectly. These shoes are a perfect fit for my needs and my budget. They are light weight durable and last as long as they are fresh. Even 500 dollar sneakers stink out before they wear out. I buy these every month and as long as they are available and affordable, I'll buy'em and recommend them for every day or casual. Thank you Chamaripa. It's a nice feeling shoe, but, the tongues on them are too short, in my opinion. And, the back of them, against the ankle, are a little too short too. Other than that? They feel pretty good on my feet. I hope Chamaripa will come up with better design in future. all in all avg shoe. for this economical price, a good lightweight shoe to get you thru Spring. Not a good choice if you are looking for a high end walking shoe of exceptional quality though. For basic needs, and price, this shoe is a good fit. and I'm just glad that Chamaripa carries shoes that I like at prices a low-wage person like me can afford. Quick Shipment. Shoe is lightweight; surprisingly comfortable for a budget shoe. This is the 2nd pair I have bought in the last 2 years; and walk anywhere from 2-5 miles per week; on average. Can't go wrong for the price; even if like me; you need another pair in the next few years. I have never ordered shoes online before. They took a little longer than I expected to arrive but it was worth the wait. These shoes are so light I didn't know I was getting shoes by the weight of the package. Light and so comfortable right out of the box. I had never experienced that before. I always had to wait for a wear-in period. They look nice, feel nice, and the price was nice. Thanks! I got a pair a few months ago, and love them. good winter shoe. nice and warm , also dry. I work at a campus style apartment complex and according to a phone app, I walked about 600 to 700 miles in these shoes on various terrain before the soles went completely bald. That's impressive. I just bought 2 more pairs. they never fell apart or hurt my feet. What a deal. I never got service like that from expensive shoes. I am 40 years old, and care less about wearing a "name" brand. After my puppy ate my favorite running shoes, I needed a quick, inexpensive replacement. These sneakers are remarkably light, airy, and ooooooh so comfortable! They easily became my new favorite with a fraction of the cost of my more expensive shoes. Top it all off with the convenience of shopping at Chamaripa.com, it certainly was a spectacular experience! Shopping at Chamaripa is always fun, but getting the same values without leaving my home is even better! Thanks for the wonderful experience in purchasing this shoe. I will be sure to buy more as soon as possible! The packaging and presentation was great from a marketing perspective. These little things help you to be above and beyond your competitors. It's a pleasure. I strongly recommended everyone to buy this shoe. Many thanks for the shoes received today, they look great and are also a good fit (without the insoles). This is now my fourth pair of shoes from you since I discovered your website and I love them all. May I congratulate you on your service, as I only ordered these on Sunday night and I have already received them and it's only Wednesday lunchtime! I have tried several brands of shoes designed to give increased height. I love this shoe the best because of the comfort, styling and quality. They are definitely the most comfortable to wear. I wear the sporty model whenever I am not working. Although the increase in height from a normal shoe is only really a little more than an inch or so, it really does make a difference. I am amazed at how differently the world looks from just that little bit higher, and how it puts me on a more equal footing with people who are taller. I love these shoes! They are cool, extremely comfortable and the quality is outstanding! I have been wearing this first pair for a couple of months now and they are extremely durable. I am just about to place a second order for a different pair... The first shipment I received very fast (within a week) and the package was impeccable wrapped. - Thank you and I look forward to checking out future designs. This particular model was appealing to me because of its elegant leather pattern, they look great with almost any colour of clothes and the leather is of excellent quality. I am very satisfied with my buy, plus the mailing was very fast, in three days they were at my door. Thank-you very much and all the best. a really great company the shoes were delivered really quickly and they were top class and very comfortable you would never no that they increase your height.They are good for my vertebral spine.I use them as orthopaedics. they are truly amazing. thank you. I will definitely recommend this shoes to everyone out here. Hi,just wanted to say thank you very much for my order. I have now bought three pairs of shoes from you since my first order just over seven months ago & have been delighted with them all. Each pair has been exactly as described on your web page, well made, comfortable & reasonably consistent in sizing. UPS delivery has been less than 72 hours on each occasion & on the one order that you sent the wrong size in error, you promptly arranged for collection & dispatched a replacement. I have always received a reply to my emails within hours, if not minutes. Thank you for a great range of shoes in which I always feel smart as well as simply taller & for an excellent service. I am very pleased about my experience with this Shoe, because I had to return my original pair of shoes because the size was to big. I was surprised that the support team replied my messages very fast and in a very polite way. I had some doubts about buying shoes from a country more than 2000 km away but now I would recommend this Shoe to anyone because they have a high quality service. bought this shoe a couple of weeks ago for a return to the gym shoe after surgery on my forefoot in early January. Would have loved to find a women's shoe, but there were none that worked for me. Figured a 10.5 would be ideal, so I went over to the men's section and snagged this. It has an ample toe box - a major requirement for me - and great arch support. Even though I am not wearing it for trail running (or any running for that matter) I wear it for cardio: Zumba and elliptical, and have worn it to work a few times as well. So far, this has been a great purchase. This shoe is exceeding my expectations! We bought these for a trip to the Grand Canyon at the last minute. Like right before we got on the plane. My husband wore them all the time in Arizona and throughout a hike on the outer rim. Never hurt his feet as said they are super comfortable. Loved them!!! These are the most comfortable sneakers I've ever purchased. My spouse recommended this brand and I'm very fussy with how shoes fit. Wide width sneakers are difficult to find without spending a fortune. This shoe is a great buy at a reasonable price. My husband said the fit is perfect, and the sneaker comfortable. It's a great looking shoe as well, so bonus. I have wide feet and I do a lot of running on trails. These are light and perfect. I've run a marathon in this shoe and I'm about to run a SkyRun (mountain ridge run) in these. 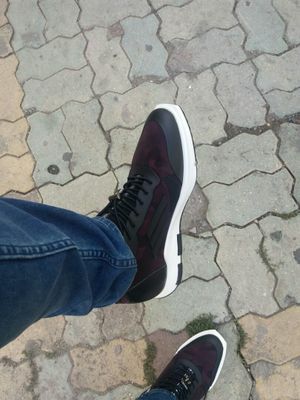 I am basically loyal to Chamaripa, love the brand, u can say i am addicted to this brand, particularly this shoe. We found these on the clearance rack of all places, and in just the right size for my twin son. They fit well and after several weeks of hard wear (hey, he's 21!) they're still looking great and he loves the fit. I know from previous experience that Chamaripa makes a great shoe, so we know we'll enjoy these until it worn out! After trying on several different brands that did not fit well, I was delighted with these sneakers. They look great and they fit perfectly. I wanted Nike sneakers, but for some reason Size 11 sneakers were all too small. Very disappointing.But these training shoes are terrific! its feather light and comfort to the core. I'm very picky when it comes to shoes but these are incredibly comfortable and fit great.This one is my second pair. I wore the first for a year. Very well made and fit great. Have very wide flat feet and these are the best trainers I have ever had. I usually role off the side of the shoe but these held true. Terrific price too. I learned a while ago that when it comes to athletic shoes, more expensive does not necessarily mean better. These shoes are light, comfortable, and give a sturdy feel. I enjoy wearing these shoes , been looking for quite a while .They are a good value for the price. I do a varied workout routine and these shoes are very comfortable and supportive no matter what the activity. Whether you run, lift weights or do cardio these shoes are a good option. They offer great support to your arches and hold up even after long periods of running. I will definitely buy another pair. We are so sorry to hear that you are not satisfied with this shoes, if the shoes do not fit you please contact us for a new replacement for the first time, we offer the return policy. And we have the size chart to help you choose the right size if you are not sure your size please refer it or consult our customer service. Thank you! I'm pleased with the quality of the shoes I ordered. Most probably will order again. For the price and quality, I'm satisfied. Overall it's a slip on that makes my work outs so much better. 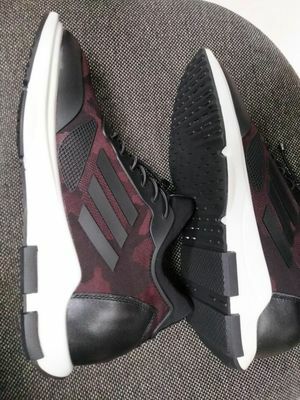 I'm so impressed by the quality of these hidden heel shoes , I don't really buy leather shoes online coz most of them are not good but my friend told me she bought these and had a great quality and she is right this shoe is impressive very nice and good quality of shoes, I'm happy and satisfied with my purchase. You’re the best, Its wine red & white. Thank you again for sharing such a positive experience. It means the world to us. Comfortable. Soles have started to wear after just a few weeks. But I'm hard on shoes. It's not their fault. Insoles are soft but take some getting used to because when you walk you feel your foot sink into the foam with each step. Laces stay tied. Very lightweight shoes, better for running than anything else. Overall shoes wears great. Ordered a size 10.5 and they fit just right, Chamaripa has size description on the description. Only downside is the shoes lace, I dont like the material of it. Really comfortable, I use them to work 12 hours shift and they feel great all day long. These are great. They are basically weightless, breathable like sandals (you'll know what I mean when the wind blows), and they're super comfortable. Very happy with the product and price. Great shoes; got an extra 3 inches which is good enough for me.and the sneaker is light weight and breathable, good for sports and daily use. This is the 4th pair I buy from Chamaripa shoes store and my brother really loves them, very good quality and they came in very fast! Great quality. Fits perfect. I would definitely recommend the Chamaripa elevator shoes. You’re the best, Robert. Thank you again for sharing such a positive experience. It means the world to us.